Vive Crutch Pads - Padding for Walking Arm Crutches - Padded Universal Underarm, Forearm Handle Pillow Covers for Hand Grips, Armpit - Soft Foam Bariatric Accessories for Kids, Adults (1 Pair) by VIVE at Get Cheap Health Insurance. MPN: CSH1013. Hurry! Limited time offer. Offer valid only while supplies last. ULTIMATE CRUTCH COMFORT: A must-have accessory for anyone using crutches, the Vive crutch pads are made with a soft, high-density foam padding that provides exceptional comfort throughout the day. Covered with a moisture-wicking, breathable material, the washable crutch pads will not snag clothing or cause excessive wear and pilling on clothing materials. ELIMINATES CHAFING AND PAINFUL PRESSURE: Latex-free foam crutch pads eliminate chafing, as well as reduce painful pressure on armpits and hands. Extra soft, the premium foam crutch pads will not irritate the skin. EASY TO INSTALL: Easily attaches to most standard adult and youth underarm crutch pads in an instant. 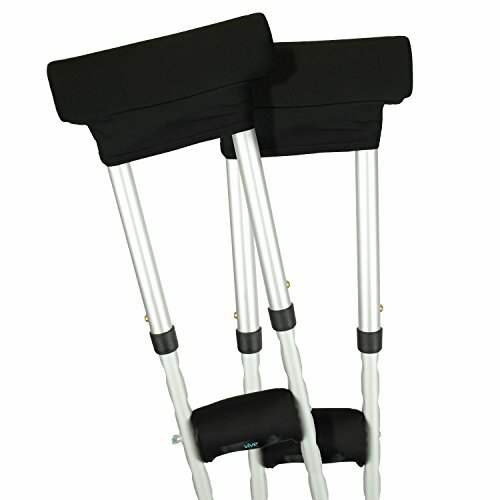 Simply stretch the cover material over the rubber crutch pad and secure it with the hook and loop straps. The padded hand grips wrap around the existing crutch grips and are attached with a strong hook and loop fastener for a secure, non-slip fit. BREATHABLE, NON-SLIP CUSHIONING: Superior contoured foam retains its shape through extensive use, providing nonslip cushioning for ultimate comfort. The breathable material prevents heat build up, keeping you cool and comfortable. Included with the crutch pads, the foam hand grips prevent hand fatigue by reducing friction and evenly dispersing pressure. The hand grips are covered with leather to prevent slipping.